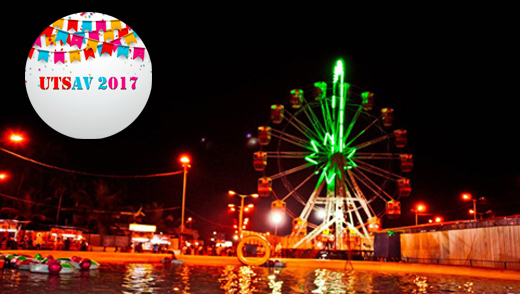 Udupi, Dec 3, 2017: The annual Udupi Utsav will be held at the Royal Gardens here from December 3 to February 15. It is being organised by the National Consumer Fair. Gautam Agarwal, Director of National Consumer Fair, said here on Dec 2, Saturday that there will be 25 amusement rides at the utsav. Huge food courts selling various food items and a selfie gallery will be the other attractions. The major attraction will be a 90-ft-high replica of the Eiffel Tower. The size of its base itself is 50ft x 50ft. Designing and constructing the replica of the Eiffel Tower was not an easy task. This tower replica is made out of 20 tonnes of steel. It has been designed by artist Shekar. There will be 100 stalls selling various items. These include household products, electronic goods, handloom products, footwear, bags, readymade garments, handicrafts, decorative items, calendar photos, 1 g gold ornaments, and books. The entry fee is Rs. 50 per person. There is no entry fee for children up to three years. However, there will be free entry on December 3, the inaugural day. Meenakshi Bannanje, Udupi City Municipal Council president, will inaugurate the utsav at 5.30 p.m. today, Dec 3, Sunday.